This page lists the wide variety of London screening venues, including: arts centres, film and video clubs, independent cinemas, galleries and museums. These venues are listed because they have experience showing artists' moving image work. The Curzon Soho show a broad range of art-house and independent films and shorts. 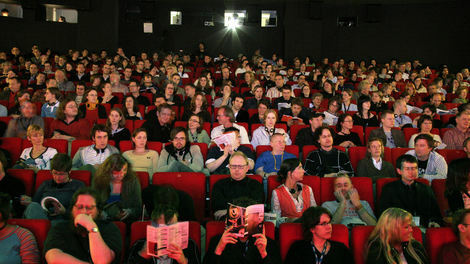 Situated in London's Soho district, the cinema has three well equipped screens and there is also a cafe at street level. Curzon Cinemas also operateCurzon Mayfair. The Exploding Cinema is a coalition of film / video makers committed to developing new modes of exhibition for underground media: from DIY screenings in all kinds of venues to low/no budget film tours, cable TV and the internet. They hold regular open screenings of film / video for makers who want an audience for their work. The group is voluntary and totally democratic, anyone can contribute, and anyone can join. The Greenwich Picturehouse has 5 screens and will show a range of mainstream releases, foreign language and independent cinema, special seasons and visiting festivals. They also programme a wide mix of live music, comedy, artists' film and video work and special film events in their dedicated basement screening room. The Horse Hospital is a unique arts venue in London which has been providing a space for underground and avant-garde media since 1993. They offer regular events to members showing rare film, music, and art, as well as hosting a significant collection of fashion items and related material. ICA is one of the leading venues for moving image work in the UK. Their program of national and international artists includes exhibitions, film seasons, lectures and seminars and a variety of performances. They also have a New Media centre which commissions and hosts a variety of work. The BFI Southbank offers the widest range of films screened anywhere in the UK. Run by the bfi this is a national organisation which screens rare silent comedies to cutting edge digital cinema, blockbusters to B-movies, classics to cult movies in a variety of seasons and retrospectives. They host a wide selection of festivals throughout the year including the London Film Festival, Gay and Lesbian Film Festival and other smaller festivals such as Optronica and Resfest. The Rich Mix is a dynamic cross-cultural arts and media centre in the heart of the East End, designed to bridge cultures and disciplines to create an entirely new kind of arts centre. This vast former garment factory now houses a three-screen cinema; exhibition and event spaces, cafe and a broadcasting centre for BBC London; opening throughout 2008 are recording and music training studios; a 200-seater performance venue; education and workspaces. The Rio has developed into a cinema that is responsive to the interests of sections of the community often ignored by mainstream commercial cinema. Examples of this are the annual Turkish and Kurdish film festivals, the Saturday morning Children's Picture Club, midweek Classic MatinÃ©es, the recently introduced Parent and Baby matinaes and participation in Spanish and Gay and Lesbian film festivals. While all the other cinemas in Hackney have disappeared or become snooker halls and car auction rooms, the Rio continues to adapt and flourish. Riverside Studios is a leading centre for contemporary and international performance and cinema. Based in west London the cinema is one of the few independent repertory cinemas in London and works closely with a wide range of cultural centres to organise its program of international festivals and seasons. Tate Modern and Tate Britain present an eclectic range of moving image work - from films and videos made by artists, thematic programs to compliment exhibitions, collaborations with LUX and screenings of documenters from the holdings of the bfi National Film and Television Archive. Additional screenings are organised by Tate to complement their symposia and talks programmes. The Tricycle Theatre produces a challenging and innovative programme of theatre, cinema and visual arts attracting the local community and audiences from across London. The Whitechapel Gallery run a wide range of large scale exhibitions, performances, talks, seminars and a dedicated film programme.